Box Dimensions (LxWxH) 4.5 x 4.05 x 1.4"
97 Tri-Color Inkjet Print Cartridge is rated 3.8 out of 5 by 21. Rated 3 out of 5 by blackhawk52 from HP 97 Tri-color ink cartridge This is the second set of cartridges that I ordered from HP-the first ones the color was dull. Trying to print bright colored brochures and still this set is also dull. The pictures look like they were taken in the dark, not like they used to be with other cartridges purchased last year. Those cartridges looked like the original pictures taken from the camera. Something has changed at HP in their ink and the way cartridges are made now-recycled maybe? Rated 5 out of 5 by DrSuess from Great ink for color printing. Great ink that always is consistent in quality. Performance is good, dries fast and doesn't smear. However, I am disappointed that HP discontinued the HP99 cartridge for photo printing. I really need this to print excellent photos for my large format Photosmart printer that still works great. Rated 2 out of 5 by madmamma from Prints fewer pages than advertized I don't know what size photo is in the description for 330 pages, but I only get less than 50 pages of 8 1/2 X 11 photos with one Tricolor 95 ink cartridge and that is only on 'Normal" setting. If I use the "Best" I get less than that. I do agree that the photos on "Best" setting are very good, but that is about $.58 per copy. VERy, Very expensive if you ask me. I also have to use only HP Photo paper. Any other paper, even good quality KODAK, does not print very well. This is the 4th HP printer I have owned. Looks like I would learn! I will never own another one. Rated 2 out of 5 by Paul31 from Very low Capacity Claims "Up to 560 pages", yet I consistently run out after about 30. I understand the page coverage matters, but they could at least make the cartridge a little bigger. Rated 5 out of 5 by Beav1956 from Excellent color reproduction I use HP 97 by the gallon, it seems. I use it mostly to print color photos for my grandson's sports scrapbooks, so I don't get nearly as many pages as HP estimates you will get from a cartridge of HP 97 ink. But the colors are brilliant and reproduced true to life, so I continue to purchase it on a regular basis. I would highly recommend this product to anyone interested in printing lifelike images. Rated 5 out of 5 by Des123 from Excellent product! 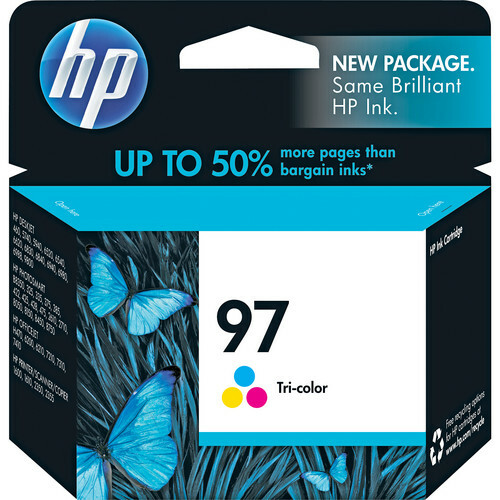 HP inks never let me down, page count is always just about spot on, colors are matched very well with my designs, it never clogs or "spits" - I have two HP printers, and I am a loyal customer for a good reason: they work, every time. Rated 3 out of 5 by HPInkDollars from Very Expensive. Very expensive. Check ink $$ prior to purchasing printer. The HP Deskjet 6980 is a great printer allowing for individual envelope printing, a feature I haven't found on any other printers to replace this one.